Last time I did the Photo A Day project (in 2010) I made four pages for each month. The first page for each month was a pocket page, on which I pasted ephemera collected over the month. The pocket held most of the photos. The next two pages were the two sides of an American Crafts divided photo protector (the kind that hold six 4×6 landscape photos on each side). The final page was a scrapbook layout using one or more photos from the month that had a common thread or allowed me to tell a particular story. I enjoyed this format. Roll on 2011 when I’d decided not to take a Photo A Day – but I grabbed a Project Life album on special (go here to find out more about Project Life). This is what I’m using for my 2012 project – and I’m pleased to say that it’s working out OK so far. I’ve finished January and am still snapping a photo every day (often more than one). 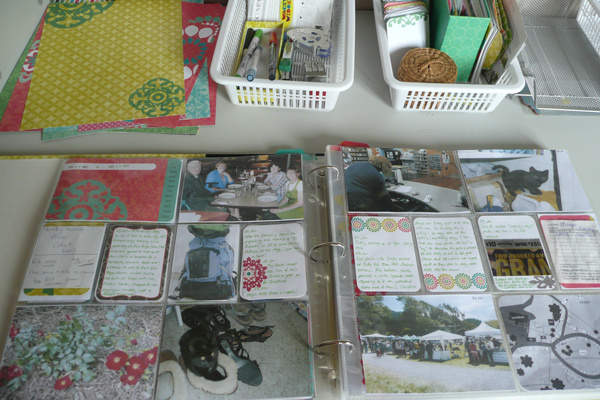 I’m managing to fit the bits and pieces I collect (receipts, cards, flyers) into the pages as well as writing enough to help me remember the whys and wherefores for each photo. It’s fun – and very affirming to have four weeks done. I’m off to complete week 5! This entry was posted in I'm creating and tagged photographs, scrapbooking by Margot. Bookmark the permalink.